An Irish pub is an establishment licensed to serve alcoholic drinks for consumption on the premises. 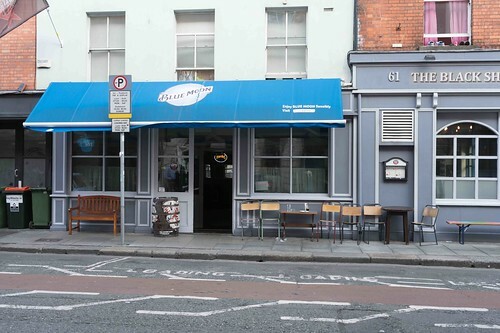 They are characterised by a unique culture centred around a casual and friendly atmosphere, hearty food and drink, Irish sports, and traditional Irish music. Their widespread appeal has lead to the Irish pub theme spreading around the world. Irish pubs have existed for roughly a millennium, the title "oldest pub in Ireland" is held by Sean's Bar in Althone, County Westmeath which was established in the 10th century. The Brazen Head in Dublin City was established in 1198 and holds the title "oldest pub in Dublin". It was not until 1635 that the government required pubs to be licensed. Grace Neill's in Donaghadee, County Down, Northern Ireland which became licensed in 1611 holds the title of "oldest licensed pub in Ireland". Irish pubs or public houses were the working man's alternative to the private drinking establishments frequented by those who could pay for entry. In 1735 the Drink on Credit to Servants Act was enacted stating that any publican who sold a drink on credit to servants, labourers or other low-wage earners had no right to seek help from the law in recovering that debt. It is the oldest law related to Irish pubs that is still in effect. During the 18th century it also became illegal to be married in a pub. Irish pubs underwent a major transformation during the 19th century when a growing temperance movement in Ireland forced publicans to diversify their businesses to compensate for declining spirit sales. Thus, the 'Spirit grocery' was established. 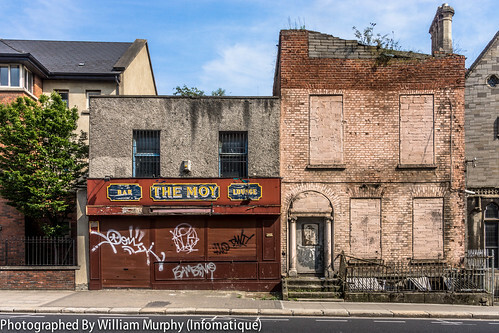 Pub owners combined the running of the pub with a grocery, hardware or other ancillary business on the same premises (in some cases, publicans also acted as undertakers, and this unusual combination is still common today in the Republic of Ireland). Spirit groceries continued to operate through World War One when British law limited the number of hours that pubs could operate. Some spirit groceries continued after the war, only closing in the 1960s when supermarkets and grocery chain stores arrived. 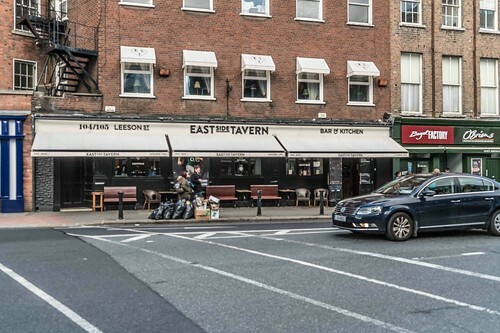 With the arrival of increased competition in the retail sector, many pubs lost the retail end of their business and concentrated solely on the licensed trade. Many pubs in Ireland still resemble grocer's shops of the mid nineteenth century, with the bar counter and rear shelving taking up the majority of the space in the main bar area, apparently leaving little room for customers. This seemingly counter-productive arrangement is a design artefact dating from earlier operation as a spirit grocery, and also accounts for the differing external appearance of British and Irish pubs. 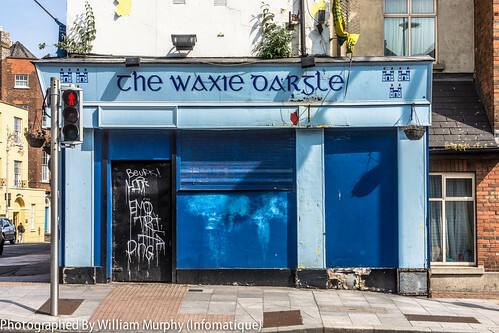 Spirit grocers in Northern Ireland were forced to choose between either the retail or the licensed trades upon the partition of Ireland in 1922, so this pub type can no longer be found in the North. Unlike their British counterparts, Irish pubs are usually named after the current or previous owner or the street they are located on. 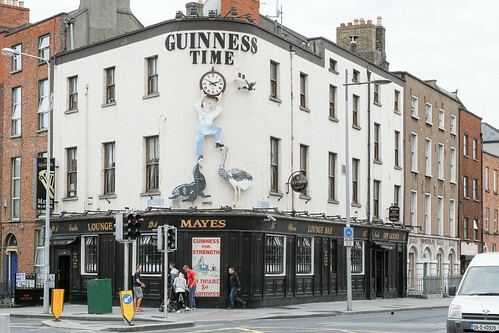 Elaborate exterior decoration is rare, but was typified by The Irish House on Wood Quay in Dublin, which was surrounded in 1870 by coloured friezes of nationalist heroes, and with iconic traditional themes such as round towers. Parts of Ulysses were filmed in this pub in 1967. Irish pubs traditionally did not sell food as dining out was not a major part of Irish culture. That changed in the 1970s and food is now a significant part of the Irish pub experience. 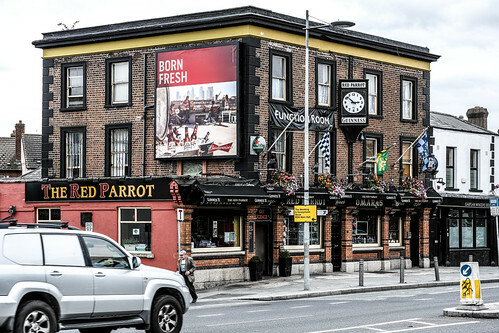 Over the years, individual Irish pubs have been associated with famous Irish writers and poets such as Patrick Kavanagh, Brendan Behan and James Joyce. In 2004, the Irish government passed a law outlawing smoking in pubs resulting in many pubs having outdoor smoking areas. Pubs in Northern Ireland are largely identical to their counterparts in the Republic except for the aforementioned lack of spirit grocers. Traditional pubs in Belfast include The Crown Liquor Saloon (owned by the National Trust) and the city's oldest bar, White's Tavern, which was established in 1630 as a wine shop. Outside Belfast, pubs such as the House of McDonnell in Ballycastle (a former spirit grocery retaining all the characteristics of the type) are representative of the traditional country pub. Peadar O'Donnell's is a famous traditional pub on Waterloo Street in Derry, while The Farmers Home is another fine traditional pub in Strabane, County Tyrone. For centuries, the Irish public house has been an integral part of Irish social culture. In Ireland the local pub is a pillar of the community the same way the local church would be. It functions as both a place to consume alcohol at leisure as well as a place in which to meet and greet the people of a locality. In many cases, Irish people will have one (or more) pubs which are referred to as 'the local' which is the pub which they frequent most often. There is generally a very close and mutual understanding and informality between the customer and the bar staff and, in many cases, particularly in country pubs, virtually all of the regular customers will know each other very well. That warm and friendly atmosphere extends to outsiders as well and it is not uncommon for strangers or tourists to be drawn into conversations with locals. In addition to the casual social atmosphere, hearty food and drink, sports, and traditional Irish music are hallmarks of pub culture. Food is usually homey and traditional featuring classic Irish dishes like Irish stew, boxty, and Irish soda bread. Drinks include a variety of spirits and beers on tap but one can certainly expect Guinness and Irish whiskey such as Bushmills or Jameson. Irish pubs with televisions frequently show sports such as Gaelic football or hurling. While not all Irish pubs will feature live Irish music, it is an important part of the culture. The etiquette in Irish pubs varies from place to place. Generally speaking, however, it is never necessary to tip bar staff. The only exception to this rule might be in a pub which has waiters for serving food, or for staff at a hotel bar, or on special occasions or events when the bar staff show particular skill, hard-work or good-humour. But again, this is rare. In addition, unless there are waiters, patrons must order their drinks at the bar, pay the bartender and bring drinks to their seats. It is traditional that when with a group, patrons take turns buying rounds of drinks for the group. It is considered bad manners to leave before buying your round of drinks.